In addition to the wide range of legal services we offer for individuals and businesses, we have specialist knowledge of working with clients from the recruitment industry in Brighton, Sussex and beyond. Having represented a large number of recruitment companies nationwide, our team based in Brighton understand the legal issues you face on a daily bases. Our industry knowledge coupled with our legal expertise means that we are uniquely placed to offer you tailor made advice on all aspects of the law that affects the recruitment sector. We are also uniquely placed to offer employment law advice to your candidates. Read more here. We offer a variety of pricing structures to suit our clients’ needs, ranging from the traditional hourly rate to monthly retainers. Freedom to focus on your business. At Cognitive Law, annual retainers are available from as little as £300 per month giving you constant access to legal advice, whenever you need it, on all commercial legal matters relating to your business, from experienced, qualified Brighton based solicitors. To find out more about what an annual retainer includes click here. These may be available for Backdoor Hire claims (Subject to approval). They work on a No Win – No Fee basis. If you win the claim, then you pay us the appropriate fees, most of which will be recovered from your opponent. However, if you lose the claim, you only have to pay the expenses it cost to pursue the claim. Our aim is to take a practical and commercial approach to providing high-quality legal advice on any matters that cross a recruitment director’s desk. 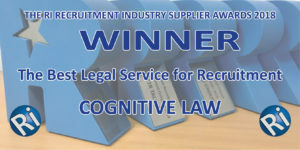 Cognitive Law is a client centric law firm with outstanding levels of service at the core of its business. Our solicitors are uniquely placed to provide commercial and legal advice at every level, from the board, through operations, to the sales floor. Why does a recruitment company even need to use a firm of solicitors? What should Recruiters do to protect against anti tax evasion? To read more articles relevant to the recruitment industry please visit our News page here.